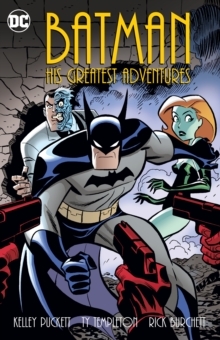 The best of Batman's adventures and trials are here in BATMAN: HIS GREATEST ADVENTURES, an all-ages anthology graphic novel. With over seven decades of storytelling from some of the greatest writers and illustrators in comics industry, Batman has become one of the most beloved characters of all time. Now you can catch up with some of the Dark Knight's best tales with this collection, which boasts stories by talented creators including Kelley Puckett, Ty Templeton and Rick Burchett. Born without super-strength or a magic lasso, Bruce Wayne decided to become a caped crusader after the tragic death of his parents at the hands of a petty criminal. Gifted with only a brilliant mind, the man who would become Gotham City's protector honed his skills through hard work and perseverance. After years of rigorous training, the hero known as Batman was born! BATMAN: HIS GREATEST ADVENTURES includes stories featuring Batman's greatest enemies and allies, including the Joker, Robin, Catwoman, the Riddler, Commissioner Gordon, Penguin and more! Collects BATMAN ADVENTURES #3, BATMAN ADVENTURES #11, BATMAN ADVENTURES #19, BATMAN AND ROBIN ADVENTURES #4, BATMAN BEYOND #1 and THE BATMAN STRIKES #6.